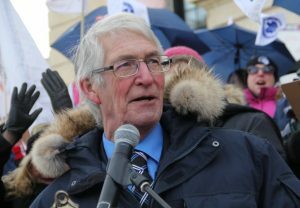 Last week on International Women’s Day, members of CUPE alongside other public sector unions and concerned residents, demonstrated against the Sask Party government’s short-sighted financial mismanagement and its harmful cuts to public services and the very people who work each and every day to provide them. It was reported to be the largest rally in recent years. It is also a time when so very much is at stake. When the Premier talks about firing frontline workers, and making cuts to public services and funding for municipalities, he is not offering any real solutions to the deficit, and he is not showing good will. When the Premier and Finance Minister talk about everything being on the table, they should stop deflecting accountability and start by reviewing costly political spending decisions – such as expensive P3 privatization contracts that are expected to be in the billions of dollars over the next 30 years, and the misguided decision to sell off profitable crown assets and public liquor stores which will see the province forego needed revenue and good jobs being lost. The deficit will not be solved by drastic reductions to key public services such as health, education and social services. Balancing the budget through cuts to public services and on the backs of public sector workers isn’t just unfair, it’s bad for the economy. Instead, the government should focus on growing and diversifying the economy, and maintaining the spending power of Saskatchewan people instead of putting people out of work. I encourage all members to learn more about real solutions to the deficit and share the report by CUPE Economist, Toby Sanger, entitled: Debunking the Deficit: How Saskatchewan can get back on fiscal track without cuts or austerity. Approaching what is expected to be a dire budget with even more drastic cuts presented by the provincial government on March 22, CUPE Saskatchewan pledges to continue standing up for public services, speaking out against harmful cuts and costly privatization, and defending the very people who are dedicated to providing public services including CUPE members in health care, K-12 education, municipalities, universities, libraries, and community-based organizations. The rally last week is more than one demonstration. It is a growing solidarity to resist reckless cuts and privatization. Together, we can stand up against cuts and austerity.